The Envoy Max represents the same great features as the Envoy with an increased lens size for more coverage. The Italian craftsmanship is complemented with out-of-sight spring hinges and megol nose and temple pads for an unsurpassed fit and finish. 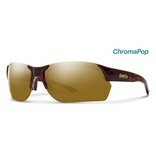 ChromaPop™ polarized lenses provide the highest levels of enhanced color and clarity. Features built for performance and style for everyday life.